Most hikes are considered their own reward, which is fine for people who are already motivated to clamber through some nature in their free time but not necessarily enough for the rest of us, who do not get up and put on pants without some sort of incentive. If you’re ever in the general vicinity of upstate New York, however, you are within range of a hike that offers this. 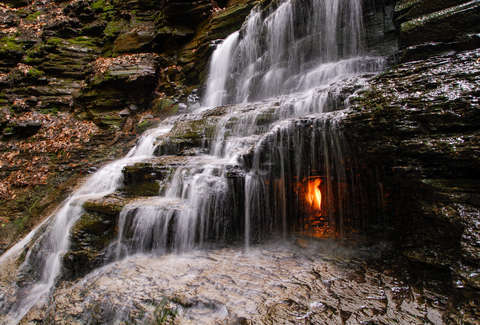 Just below the Canadian border in northwestern New York, inside Shale Creek Preserve about a half-hour drive south of Buffalo, lies a hiking trail with an unusual payoff, if you can find it: Eternal Flame Falls, a waterfall tucked away in a grotto that contains a natural “torch” about 8 inches high. The ground at the base of Eternal Flame Falls emits a steady supply of natural gas, which rises from deep below the surface up through fault lines and into the open air. This, in turn, is what lights the flame, found on the waterfall’s right-hand side about 5 feet up from the creek bed. There are a number of these around the world, but they’re typically underground where you can’t see them -- certainly not in so picturesque a setting as behind the curtain of a waterfall in a forest grotto. The flame is visible year-round, but the waterfall can run dry in the summer and often is only fully flowing in the spring. If you go right after there’s been some decent rainfall, you’ll get to enjoy the waterfall’s full effect. The flame stays lit on its own, but bring a lighter just in case -- occasionally it goes out, in which case it’s your duty as a good citizen to relight it. It ignites quickly, with a distinct “pop,” so maybe try one of those extra-long candle lighters if you’re nervous. Shale Creek Preserve is the best-known of several creeks within the larger Chestnut Ridge Park. The hike can be muddy and the trail a bit overgrown, so while it’s not a challenging hike per se, it is at least moderately difficult. Just keep the terrain in mind so you can choose the appropriate pair of shoes. The hike is only about half a mile; check out the interactive map here to choose your starting place. You’ll know you’re getting close when you smell that sulfurous, rotten-egg smell. You’re allowed to bring pets on the hike, so long as you keep them leashed, but due to the unusual features of this hike (waterfall, fire) Erie County Department Of Parks, Recreation & Forestry does recommend that for safety reasons you leave them at home. And of course, while this applies to any hike, or any time anyone goes anywhere that is not their home, please don’t litter or tear up any plants or otherwise desecrate the site. Just turn the lights back on if you need to.